The inspector is giving a lot of bad advice. It thinks you can remove the (int) cast. yPixelBase, y, ylow are int. scaley is double. where file is a File. Roedy, I was unable to reproduce any of these issues. with complete examples so that we can reproduce them? long to Long, but not long to int. removing casts it should not. Created with: IntelliJ IDEA IDE. // Math.round returns a long. I also do not see any problems with the inspections. (I'm using IU-95.4) As Thibeaut said, the one example is correct, and the other examples IDEA does not recommrend you remove the cast. I turned on all inspections, and the only warning I got on the others was "Cast from 'int' to 'long' may result in a loss of precision" with no quickfix offered. Did you see these after getting some exceptions perhaps? >I also do not see any problems with the inspections. 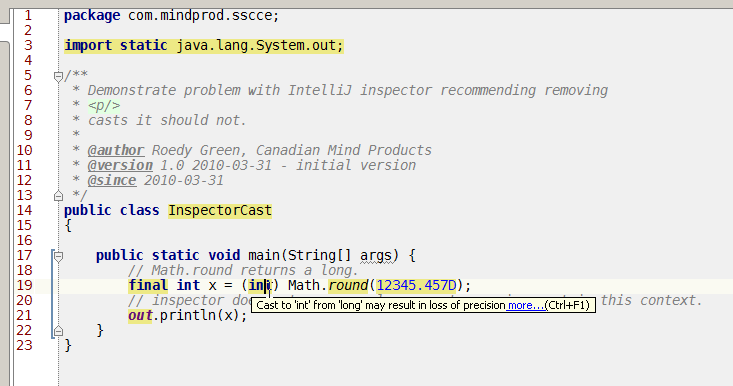 (I'm using IU-95.4)Â As Thibeaut said, the one example is correct, and the other examples IDEA does not recommrend you remove the cast.Â I turned on all inspections, and the only warning I got on the others was "Cast from 'int' to 'long' may result in a loss of precision" with no quickfix offered. >Did you see these after getting some exceptions perhaps? lump. That was 1088 classes and 6 modules.